In the 1880’s porcelain signs were introduced in Europe , then USA started making them in the late 1800;s. Different colors of Powdered glass was stenciled then fused by baking to rolled steel , then in later times the powder was silk screened to the steel. In conclusion these made a very durable sign that has even lasted into modern times. Finally porcelain sign were phased out because of high production cost. Less durable Tin signs were also popular until the 1920’s however they also fell out of favor. These types of signs were usually painted , lithographed , screen printed or stamped and were much less durable. Neon signs moved to America in the late 1920’s and became very popular. The 1st neon sign was introduced in 1912 to a Paris Barber. Because these signs were also expensive to make as these glass tubes were hand blown & bent to form the letters or graphics. Then they were then filled with inert gases or neon, processed and then hooked to a high voltage transformer to get the desired effect. As a result these tubes were very fragile and often times they broke. Later in the 1940’s & 50’s these custom made signs were made in smaller quantities for business’s like Auto Dealerships, Clubs, Bars , Restaurants, etc. 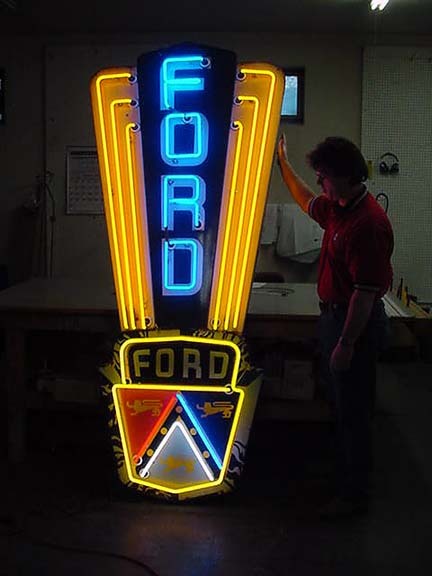 .. Mass produced modern neon signs have also become popular with collectors. Most of all these brands are Soda, Beer, Candy, Tobacco and other up coming events. There are many other types and categories of Vintage Sign collectible formats also. Examples would be, Door Pushes & Pulls, Paper, Cardboard, glass ….Although some collectors focus on certain fields & even narrow it down further to certain brands we collect everything from A-Z in Antique Advertising. Some of these fields like Oil^ Gas , automobile , Beer, Soda have become very collectible and expensive. Before you start collecting anything, due your homework, there are many thieves out there who will gladly take your money for new current reproductions or fantasy pieces, Also beware of restored signs being sold as all original…. We Buy Vintage Signs !! !